When I was a 29 year-old kid (some of us take longer than others) and beginning to learn classical music, my father and I would play a game. Bus is also largely "self-taught" about music. Despite that fact, both of us have developed an "appreciation" for "serious music". Anyway, sometimes one of us would come across a piece of music we liked that we thought we could "fool" the other one about (i.e. guess that composer). I remember playing Prokofieff's First Symphony and "stumping" (yeah, I know!) my dad. One of the pleasures I had when we played this game was listening to the composers my dad would guess and seeing if I could hear why he thought that. The reason for this personal digression preceding a "gression" (I will stop this) is that the two pieces of music I am going to discuss happen to be the kind of less-known composers we would be able to play this game about. Goldmark would sound like early Dvořák. Kalinnikov would bring to mind early Tchaikovsky. I first heard Goldmark's Rustic Wedding Symphony at a friend's house one evening several years ago. It was playing in the background as we sat and talked about who knows what. It was an early LP he had with Sir Thomas Beecham conducting. I remember thinking that the music was interesting and asking him about it. He told me that he'd bought the disc in a cut-out bin and didn't know much about it, but he liked it. I filed that away but was unable to find any available LPs of the work in the late 70s. Later I acquired an early digital LP of it with André Previn conducting. I found the bucolic atmosphere of the piece attractive and the playing superb. That recording has not appeared on CD (why?) but others have. I do not know if the old Beecham is on digital disc, but would love a copy if anyone knows of it. I do know of three CD issues, however, and it is to those that I will devote attention to recordings. First, let me relate some basic (and I stress the modifier) information about the composer and work. If you already know those details, skip this paragraph. Both Brahms and Dvořák lived in the lifetime of Karl Goldmark (1830-1915). In fact, Goldmark occasionally joined Brahms in his brisk walks around Vienna. Not much else has been printed about Goldmark and his relations with his more famous contemporaries (there's a topic for a dissertation). While I do not hear much of Brahms in Goldmark, you can hear shades of Dvořák. Goldmark was Hungarian and his Rustic Wedding Symphony seems full of the Austro/Czech/Hungarian folk melodies that inhabit music of his contemporaries. To say, however, that Goldmark had an influence on his younger colleges would be misleading. It is more likely that he was the elder of the three and developed in the same cultural milieu. The Rustic Wedding Symphony is not a symphony in any Brahmsian sense. Goldmark's "symphony" is more a five movement symphonic suite. It is full of lovely, bucolic tunes and melodies that haunt your memory after listening to it. 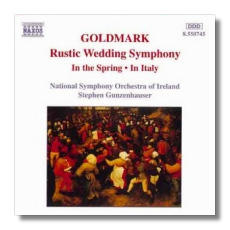 I had planned a commentary on the relative merits of the existing CDs of Goldmark's Rustic Wedding, at least those with which I was acquainted, but that has been rendered an exercise academic. The Naxos release is so superior to the Newport and AS&V that I'll stop comparisons here. Maestro Gunenhauser's interpretation to this symphony is enchanting. If anyone can impart more depth to this music I certainly cannot imagine how. The National Symphony of Ireland has a nice "local" flavor not found in the RPO. The strings swoon and sigh in a more genuine way. The oboe has a pungent, reedy sound. Gunzenhauser's work has you humming the tunes much like you might from Dvořák's 9th!! Finally, this is a stellar recording of the piece, too. I have written before musing where Naxos finds the orchestras, recording halls, and what precious equipment they use. Some companies go to pains to make sure every little extra is mentioned in the notes inserted in CD cases. All I can say is that you would not regret having purchased this disc if you'd paid three times the $5.00 going rate. The disc also contains Goldmark's "In the Spring" and "In Italy" Overtures. Also from Naxos comes a disc containing the two symphonies of Vasily Sergeyevich Kalinnikov. I no longer recall the whys and wherefores surrounding my getting this piece of music. I bought an LP of the piece with Kiril Kondrashin conducting the Moscow Philharmonic Orchestra on Angel/Melodiya 40173. Well, that LP went somewhere during the divorce of 1979-80 but I still have a cassette of it (now that RCA had license of the Melodyia series we can hope for a compact disc incarnation). Though the tape is slightly stretched I can still hear it well enough to know that it still serves as my paradigm. As the number of CDs began to pickup, recordings of the Kalinnikov began to emerge. I am familiar with three CDs of this symphony and will discuss them anon. I do not know if a detailed biography would be of much use. Kalinnikov lived a short life (1866-1901). I recall reading somewhere (the liner notes of that LP?) that he sent a copy of his First Symphony to Tchaikovsky, who didn't bother to reply. That reaction is a bit odd since it is Tchaikovsky who springs to mind as the work unfolds. The first movement reminds me at times of Tchaikovsky's Third Symphony for some reason. Still, it is not imitative and has its own rustic flavor. If the first movement calls up images from Tchaikovsky's Polish, the second movement has an eerie quality about it much like the opening of Tchaikovsky's First Symphony "Winter Dreams". The melody opening this movement was what first grabbed me when I heard the symphony. It is kind of like hearing snowflakes drift through moonbeams. I knew once I heard the opening bars I'd never forget them. The whole movement has a dreamy, haunting essence to it. The third movement is energetic and playful. It is also sensuous and oriental as it progresses, bringing to the mind's ear Rimsky-Korsakov. It returns to the playful aspect as it comes to a close. The fourth movement returns to the enigmatic opening theme to the symphony. Themes from all three previous movements return juxtaposed in a collage that is a new gestalt. While you might be reminded of Tchaikovsky or Rimsky-Korsakov, Kalinnikov's Symphony still has an original voice. There is an AAD release on Melodyia recording with Evgeni Svetlanov conducting the USSR Symphony Orchestra. It is coupled with orchestral music from some of Rimsky-Korsakov's operas. The recording date is not specifically designated but could be 1963 or 75. The interpretation sounds not only fast, but insistent. It also sounds almost monaural and has thin strings. It does offer the in a genuine, Russian voice, but next to Kondrashin it seems just fast, not feeling. Kondrashin has the orchestra dotting the i's and accenting the language. Neeme Järvi's release on Chandos 8611 sounds better. It is coupled with Glazunov's The Sea and Spring. While the orchestra is much better in this release, Järvi's interpretation seems superficial. This was the first CD I got of Kalinnikov's First Symphony, and I remember listening and being frustrated as I listened. I kept thinking that there was more to the music than was being performed. The general feeling generated was that this was a facile performance that by its facility condemns a wonderful piece of music to obscurity. While I cannot recommend the Svetlanov, at least it has more character. 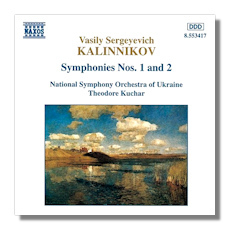 Now we have the Naxos release (8.553417), which offers both of Kalinnikov's Symphonies on a single disc. It is of some interest that all of the recordings are by a "Russian" conductor (I know that at least Järvi and possibly Kuchar might reject that tag, but let's be realistic). Theodore Kuchar's National Symphony Orchestra of Ukraine is another of those provincial orchestras Naxos has discovered that is up to the standards of most "great" orchestras in the world. While Kuchar's interpretation is more laid back than the Kondrashin, it still has all the right accents. The second movement here surpasses Kondrashin's! While I still feel the Kondrashin is the best around, it's not around and may not be. The Naxos has all the advantages in this contest because the only competition isn't available. It has the character that Järvi lacks and better sound and is less hectic than Svetlanov. Add to that the price and coupling (please RCA/Melodyia do both of Kondrashin's recordings on the same CD) and you have a four star winner. On a more beaten path, I recently added a new release of the Dvořák Symphony #7 to my collection. When I first read that Chandos had released my favorite Dvořák Symphony with Jiří Bĕlohlávek conducting the Czech Philharmonic, I knew I had to hear it. So, it was my Anniversary Gift from my wife. The disc is coupled with Dvořák's Nocturne for Strings and The Water Goblin. (I think that is also my favorite Dvořák Sketch). Anyway, I have not had time to live with it sufficiently to rave about it, but I am mighty impressed. The sound is almost tactile and there is a aura about it that makes it seem like you are able to spot where the instruments are coming from, yet they are in proper relief with the rest of the orchestra. The performance is brooding and yet sweeping where it should be. I am not ready to say that it is my personal favorite, but I can say that I am sure you won't be disappointed if you add this to your collection. To give you some idea of the context in which I am framing my comments on this recording I will list my favorites in alphabetical order. There is Barbirolli with the Hallé Orchestra, István Kertész on Decca, Sir Colin Davis on Philips and Pierre Monteaux coupled with Beethoven's 7th and while some of these may no longer be available I would not hesitate to recommend any of them. One of the things I love about this medium is the ability to make an enthusiastic reaction to a recording you like but not be bound by it forever. Readers can read within two weeks any "updates" I will make. Then there will be another update at four weeks. Then, as needed. The idea is that you can follow along with the development of an opinion as it evolves. This gives the writer the freedom to feel he can share initial reactions in print but not be pegged to them as he grows with a recording.